Chinese Food is one of my favourite cuisines - I love the different mix of flavors - sweet & sour & spicy, its light and yet filling, and best of all its so easy & simple to eat - the chicken is boneless, the vegetables are all chopped up and well, you usually eat it with a fork and a spoon since its either rice or noodles so no mess. But making it at home is well a completely different story - I rarely make it at home because well, there's just too much chopping required and one dish is rarely enough so making the rice then noodles then gravy is not so simple. I have pretty much switched to ordering from outside (review of some of my favourite Chinese outlets coming up soon) but there are some dishes that I love making at home. My quick Hot Garlic Fried Rice is well, the best way to use up leftover rice, and Chicken Chilli Dry & Chicken Chowmein. 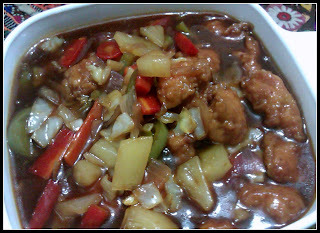 But other than these, another thing that I have to make at home is Sweet & Sour Chicken. I had never had Sweet & Sour Chicken till my cousins introduced it to me - it was one of their favourites and they would always order it at any new chinese restaurant that they tried. Not only did they love having it outside, but my Momani used to make a really really amazing version at home - and the reason that it stood out was that she used pineapple chunks and pineapple juice in the gravy. Most restaurants use sugar for the sweet part and vinegar for the sour part and well, that's not real sweet & sour chicken. You need to have the pineapple in the gravy to give it that tangy flavor - a little bit sour & a little bit sweet making it all taste absolutely delicious. Marinate with ginger-garlic paste, salt, soya sauce, vinegar & one egg. Leave for 30 minutes, then add cornflour and flour and mix well. Deep fry chicken pieces in oil and keep aside on a paper towel. Heat 3 tbsp oil in a deep wok. Add sliced ginger and garlic and saute till it turns light brown. Add chopped vegetables - start with adding onions and saute for 1-2 minutes, then add carrots and saute for a minute then capsicum and then cabbage in the end. After adding the vegetables, add pineapple chunks. Add chicken and mix together than add salt followed by the sauce. Add chilli powder or chilli flakes if you like spicy food. Cook for 2-3 minutes and taste the sauce and adjust seasonings if required. Add cornflour mixed with water to thicken sauce.